2017 Tornado F5W World's first 15.6in GPU- and CPU- upgradeable Mobile Workstation class laptop with Quadro P5000 (2048 CUDA cores, 16GB GDDR5X). 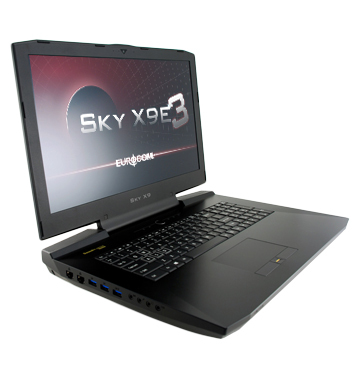 2017 Sky X9E3 Eurocom launches world's first Kaby Lake based laptop with Intel Z270 chipset, SLI GTX 1080 GPUs,5 physical drives for storage and unlocked BIOS. 2016 Sky X9E Unlocked World's first 4K Ultra HD G-sync 17.3-inch mobile supercomputer with unlocked BIOS. Till now G-Sync was only available on 17.3-inch 1920-by-1080 LCD panels. 2015 Sky DLX7 World's first "Desktop Laptop" with desktop CPU (Intel socket LGA1151 based Skylake) and desktop GPU (MXM 3.0 Nvidia GTX 980 N16E-GXX). 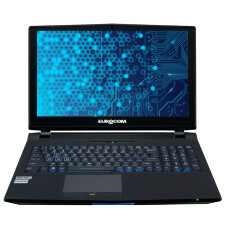 2015 Shark 4 World's first 15.6", Intel HM87 Express Chipset based NVIDIA GeForce GTX 960M powered laptop with an upgradeable Optical Drive Bay that can support a Blu Ray Drive, Standard Optical Drive or Storage Drive Bay. 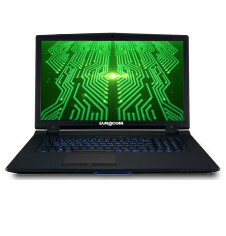 2015 Armadillo 2 World's first laptop with Intel Broadwell (Intel Mobile Core i5-5200U) Processor with ability to support 16 GB single memory modules for 32 GB total. 2015 P5 Pro World's first laptop with Ultra HD (4K) 15.6-inch display running at full 60Hz and three concurrent display support. 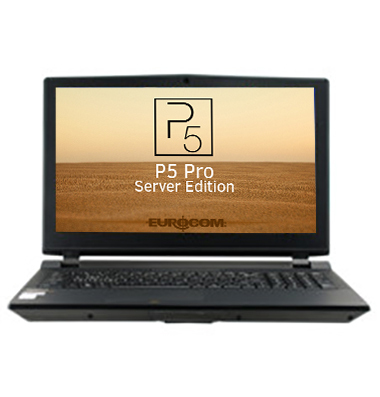 2015 P5 Pro SE World's first Xeon laptop based 15.6" Mobile Server with Intel E3 1200 v3 series socket LGA1150 based processors. 2015 P7 Pro World's first 17.3-inch laptop with Intel socket (LGA1150) based desktop CPU and powered by upgradeable MXM 3.0b graphics. 2014 M5 Pro 1) World's first LCD Upgradeable laptop; easy to change/upgrade internal display: 4K (QFHD), 3K (WQHD+) and/or 2K (FHD). 3) Total 4 storage bays including M.2 slots for extra storage. 4) Prewired for 3G/4G modules with integrated SIM slot. 5) High performance cooling system and aluminium magnesium alloy case. 6) Integrated TPM 2.0 for data security and encryption. 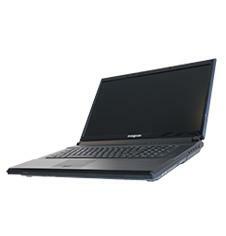 2013 Panther 5 In 2013, the EUROCOM Panther was awarded the "Intel Form Factor Solution Innovation Award". The Intel Form Factor Solution Innovation Award is given to the company that delivers the most innovative mobile solution based on Intel Technology to meet customer demands for mobility. 2013 Panther 5D World's first 3D Mobile Supercomputer with Dual MXM 3.0b graphics support and socket based Desktop / Workstation XEON Processor. 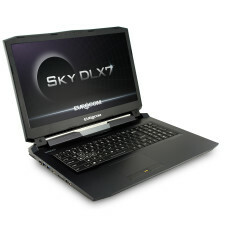 a) 17.3" dual VGA (SLI/CF) based laptop with 5 physical drives (HDD/SSD). b) Dual mSATA SSD drives capable of RAID 0/1/5/10. c) Dual built-in web cameras (5 M front based and 1 M rear). 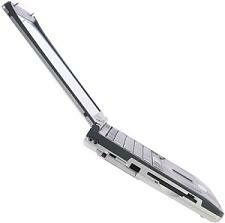 2012 P150EM Racer 2 World's first notebook with built in mSATA SSD support. 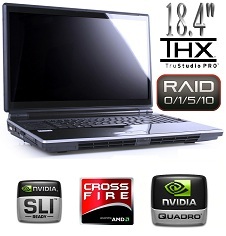 2012 P180HM Leopard 2.0 18.4-inch notebook with both CrossfireX and SLI support; Built-in light sensor to adjust LCD brightness. 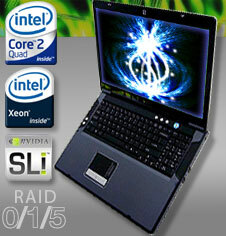 2012 Panther 5 World's first laptop with Intel Xeon E5-2600 series LGA 2011 processors. 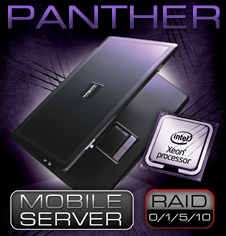 2012 Panther 5SE World's first laptop capable to support 6TB (4x 1TB) of storage in RAID 0/1/5/10. 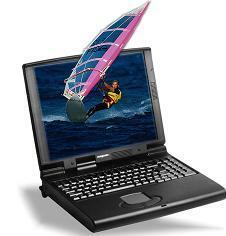 2012 Uno 3 World's first 21.5" All-in-One system with internal UPS / battery pack. 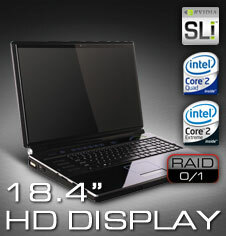 2011 P150EM Racer 2 World's First 15.6-inch notebook with a 100W Graphics Processors. 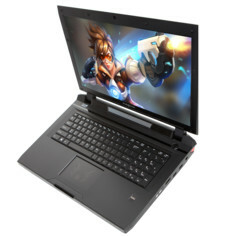 2011 P170SM Neptune 3 With built in 3D Emitter; NVIDIA Vision; with 3D Stereoscopic with NVIDIA Quadro VGA card; MXM 3.0b technology, socket CPU. 2010 P180HM Leopard 2.0 First notebook with built-in HDMI-In port. 2009 D900F Panther Server Intel Desktop i7 or Xeon Processor LGA1366. 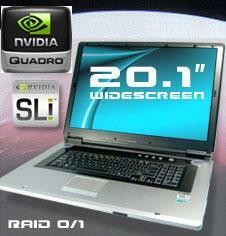 2009 M980NU XCaliber World's First 18.4" notebook with NVIDIA GeForce GTX 280M SLI. 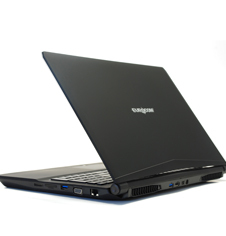 2009 W860CU Cougar One of World's First 3D laptops with NVIDIA VISION; external 3D emitter; with 3D stereoscopic support; MXM 3.0b Graphics Technology; socket CPU. 2007 D90xC PHANTOM-X World's First laptop with 1333MHz front side bus. 2007 D90xC PHANTOM-X World's first XEON based server-class laptop. 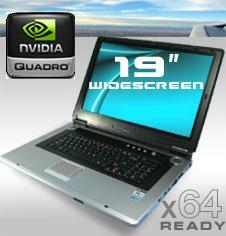 2007 M590KE EMPEROR-X The largest display ever 20.1-inch; WSXGA+ 1680x1050 widescreen display. 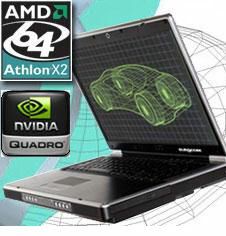 2006 M590K EMPEROR World's first workstation class notebook powered by nVidia nForce4 chipset and by the fastest 64-bit Mobile Turion64 processor with Nvidia's SLI (Scalable Link Interface) Video Technology with two Nvidia GeForce Go7800GTX, Go79x0GTX or Quadro FX 2500M GPUs. 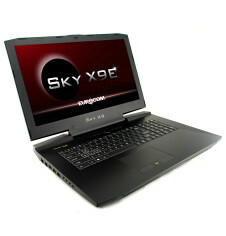 2005 D900K F-Bomb The world's first 64-bit, Dual-Core notebook with AMD Athlon64 X2 processor. 2003 5600D Monte Carlo Updated version of 5600P model based on 533 MHz FSB design, Intel Pentium 4 up to 2.8 GHz, ATI Radeon 9000 with 64 MB DDR video and four USB 2.0 ports and 1 GB of 266-MHz DDR SDRAM. Four-spindle design with two optical drive bays including an optional DVD-Burner (DVD-R/-RW), Wi-Fi ready with built-in antenna for 802.11b wireless LAN, and DJ function with a CD Player. 2003 888ES Dream Machine World's first mobile workstation with 16.1-inch UXGA (1600x1200) Display, 3.06 GHz Intel ntium 4 with Hyper-Threading, and 128 MB DDR Video ATI Radeon Mobility 9000. 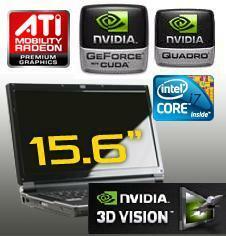 The most advanced and visually stunning 3D performance for notebooks. Key features: full size 102-key keyboard, internal TV tuner, Sony Memory Stick slot and optional internal MP3 player with Panasonic SD slot, 1 GB of 266-MHz DDR SDRAM, 2 optical drives includidng a DVD Burner, DJ function with a CD Player, and 533 MHz system bus. Built-in Wi-FI standard antenna for 802.11b wireless LAN. Optional internal IP Sharing Module for ADSL. 2003 D400S IMPRESSA A slim and light model designed for a world without cables. Fully wireless all-in-one notebook with internal Wi-Fi / 802.11b Wireless LAN, Bluetooth and integrated CCD / Video Camera. Based on FSB533 Intel Pentium 4 processor up to 2.8 GHz and DDR266/DDR333 memory up to 1 GB. 15-inch SXGA+ (1400x1050) display. 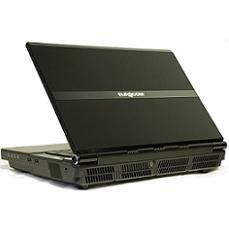 2003 D610SU Diablo Excellent value notebook in fully configurable and upgradeable design. Elegant charcoal gold colour. 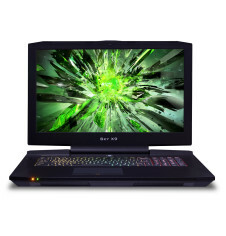 Powered by Intel Pentium Celeron and Pentium 4 processors up to 2.8 GHz 533 MHz FSB. 14.1 or 15-inch XGA (1024x768) LCD display. Up to 1 GB DDR266 SDRAM, optional external Floppy Drive. 2002 1800N Road Warrior Lightweight, slim notebook under 4 lbs/2 kg. Up to 3 hours battery life. Intel Pentium III and 12.1-inch XGA ACtive Matrix display. Designed as a mobile travelling companion. Optional integrated GPRS (General Packet Radio Service) Module. Up to 1 GB RAM. External Floppy and optical drive bay. 2002 4200 San Marino All-in-one notebook with Intel Pentium III up to 1.3 GHz, up to 1 GB RAM, 32 MB of DDR video; FireWire and Four USB Ports; Sony Memory Stick and Panasonic SD slots. 2002 5600N San Remo The Mobile version of the 5600P model. Mobile Intel Pentium 4 processor - M, 64 MB of DDR video; ATI Mobility Radeon 7500; 1 GB of 266-MHz DDR SDRAM; Four-spindle design with 2 optical drives (CD copy factory), Wi-Fi ready with built-in antenna for 802.11b wireless LAN, DJ function with a CD Player, 400 MHz system bus. Excellent battery time up to 4.5 hours with two batteries. Up to 1 GB RAM. 2002 5600P Monte Carlo World's First Pentium 4 super-notebook with 64 MB of DDR video; ATI Mobility Radeon 7500; 1 GB of 266-MHz DDR SDRAM; Four-spindle design with 2 optical drives (CD copy factory), secondary battery, DJ function with a CD Player, 400 MHz system bus. Up to 1 GB RAM. 2002 8170 Monte Cristo World's first Intel Pentium 4 notebook (Intel 845 architecture up to 2.2 GHz), up to 1 GB RAM, 16 MB of DDR video; FireWire. 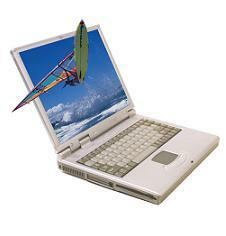 2002 8880 Dream Machine World's first notebook with 15.7-inch display, full size 102-key keyboard, internal TV tuner, internal MP3 player and Seven-spindle design. Perfect Mobile Workstation supporting Pentium 4, ATI Mobility Radeon 7500 64 MB of DDR video, 1 GB of 266-MHz DDR SDRAM, 2 optical drives (CD copy factory), DJ function with a CD Player, and 400 MHz system bus. 2002 888E DREAM MACHINE The upgarded version of the 8880 model. Super features include: full size 102-key keyboard, internal TV tuner, internal MP3 player, FSB533 5-spindle design, four USB 2.0 ports, ATI Mobility Radeon 9000 with standard 64 MB of DDR video, Pentium 4, 1 GB of 266-MHz DDR SDRAM, 2 optical drives (CD copy factory), and DJ function with a CD Player. 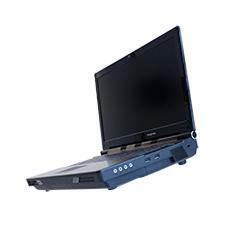 2002 D270S VIPER Perfect small footprint all-in-one notebook based on Intel Pentium 4 Processor (desktop version) and DDR266 SODIMM. Three spindle, all-in-one viper design. 14.1 XGA TFT Active Display. 2002 LP260 All-in-one LCD PC All-in-one flat LCD-PC with 133 MHz Front Side Bus and Intel Pentium III up to 1.3 GHz, up to 1 GB RAM. 2002 LP285SB Portable LCD PC All-in-one fully configurable and upgradeable 15-inch portable LCD PC based on SIS M650 chipset supporting 533 MHz FSB Intel Pentium 4 processors and USB 2.0 ports. 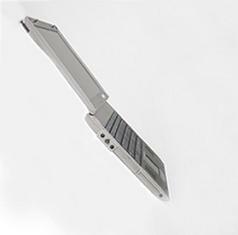 It comes standard with built-in antenna for internal 802.11a/b wireless LAN, PC Card slots and carrying handle. Intel Pentium 4 up to 2.8 GHz, up to 1 GB RAM, up to 200 GB standard easy-to-change 3.5" desktop hard drive. 2002 LP285SF EuroTouch LCD PC First EUROCOM system combining touch screen technology with the LCD PC space-saving stylish design. 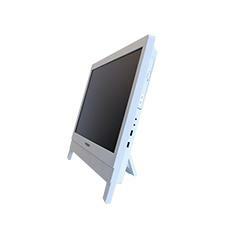 15-inch XGA all-in-one LCD PC with standard 5-wire resitive touch screen built-in. Up to 2.8 GHz FSB533 Intel Pentium 4 or up to 2.0 GHz Intel Celeron FSB400. Memory up to 1GB of DDR333 PC2700 DIMM. Optional carrying bag. 2002 LP287SB all-in-one Portable LCD PC All-in-one portable space-saving design. Large size flat panel 17" SXGA (1280x1024) display. Easy to move around small footprint complete system with LCD approx 8kg / 17.4 lbs. Standard built-in antenna for wireless 802.11a/b LAN, up to 2.8 GHz Intel Pentium 4 FSB533 and up to 1 GB of DDR333 184-pin DIMM (PC2700). 2002 LP300 All-in-one LCD PC World's first 17-inch all-in-one LCD PC TV. Four-spindle design. 400 MHz system bus and 800 MHz RAMBUS memory. Intel Pentium 4 up to 2.2 GHz, up to 1 GB RAM. 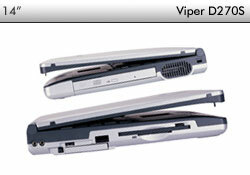 2002 M270S viperM Slim and light, three spindle, all-in-one viper design based on Intel Pentium 4 Mobile processor - M up to 2.2 GHz and DDR266 memory up to 1 GB. 13.3-inch XGA (1024x768) or 14.1 XGA TFT Active Display. 2001 2700-C World's first 133 MHz Front Side Bus with 1 GHz Desktop Replacement Notebook; Ethernet and 56K V90 modem on-Board. 2001 2700T VIPER 133 MHz Front Side Bus, up to 1.33 GHz Intel Pentium III; up to 1 GB RAM, Fire Wire, Ethernet and 56K V90 modem on-Board. 2001 LP200ST LCD-PC All-in-one flat LCD-PC with FC-PGA socket 370 Intel Pentium III processor up to 1 GHz, up to 512 MB RAM. 2001 LP200T LCD-PC All-in-one next generation desktop replacement: flat LCD-PC with 133 MHz Front Side Bus and 1 GHz Pentium III processor. 2000 3420 Ultimate Traveller Two-spindle system with hot swappable bays. 2000 5100-S DeskNote Lite All-In-One notebook with 32 MB of shared video, Ehernet and modem on-Board. 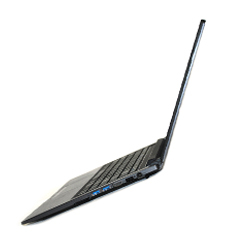 2000 8500-SE Supernotebook First Intel® Pentium® III at 600 to 800 MHz notebook; a POWERHOUSE. 2000 8500-V Super Notebook World's first 133 MHz Front Side Bus with 1 GHz processor Desktop Replacement Notebook, 16 MB SGRAM video, Ethernet and modem on-Board. 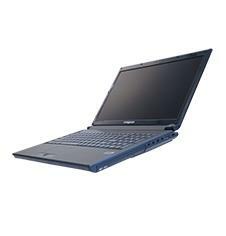 1999 2100-C DeskNote First S-370 Intel® Celeron™ - based notebook. 1999 3100-B Mobile Cinema First affordable mid-range notebook with all the power and functionality of high-end models; the ideal office on the go. 1999 3400 UltraLite First under 5 lbs. 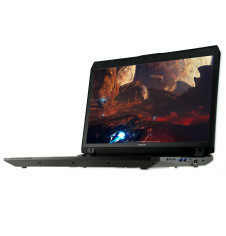 notebook with hot swappable bay, front positioned speakers, ultra thin. 1999 5100-C DeskNote Lite First colour EUROCOM notebook (cool silver). 1999 8500-C DeskNote First notebook to support Intel® Celeron� processor at 500 MHz. 1999 8500-P DeskNote Plus First notebook to support IEEE 1394 "FireWire™"; with 3 RAM slots. 1999 8500-P3 DeskNote Plus First Intel® Pentium® III-based notebook. 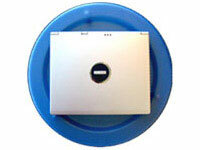 1998 1100 First notebook built to support AMD K6 and K6-2 and DVD. 1998 1100-M First notebook with MPEG-2 H/W support. 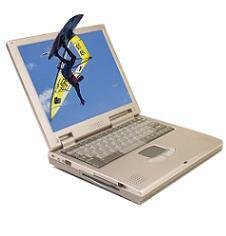 1998 1100-P First EUROCOM notebook with video capture capability. 1998 1200 First 400 MHz notebook. 1998 2100-P DeskNote With 2 hot-swappable batteries, 3 hard drives, IEEE 1394. 1998 8500-M DeskNote First notebook with an Mobile Intel® Pentium® II 300 MHz CPU. 1997 6200-A DeskNote Value edition notebook. 1997 7200 First notebook with 14.1" Active Matrix LCD and interchangable FDD, 2nd HDD and battery. 1997 8500 DeskNote World's first 15.1" XGA Active Matrix LCD Panel and a full-size 102 key keyboard. 1996 6200-A DeskNote First notebook with Li-Ion smart battery, swappable multifunctional Bay (CD-ROM, FDD, 2nd battery). 1996 6200-A DeskNote First notebook with an Intel® Pentium® at 233 MHz w/MMX and Li-Ion battery. 1995 Based on PCI architecture. 1994 First notebook with slot based CPU cache board, w/MPEG-1 support, modular design. 1993 First Socket-7 Intel® Pentium® based notebook. 1993 Socket-7 with "hot swappable" battery packs; NiMH battery, large 25mm front positioned trackball (Eurocom Smile), modular design, removable HDD Bay, Type IV PCMCIA card slot. 1992 EUROCOM 8200: First notebook with 8.5" & 9.5 Active Matrix Display. 1992 EUROCOM 3500C: World's first colour display (single scan), DX-2 technology, PCMCIA card slots. 1991 EUROCOM 3500A: First notebook with a VESA local bus system. 1991 EUROCOM 3500: First notebook with 486DX Intel Processor, choice of displays (8.5" Active Colour Display, Single Scan Colour, Mono). 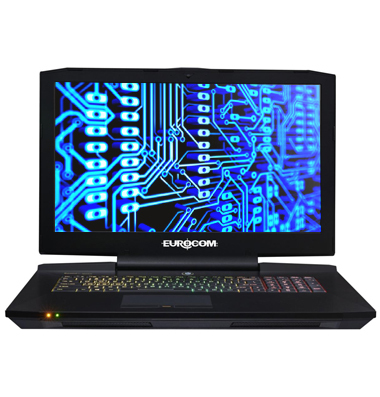 1990 EUROCOM 3300: World's first 33Hz 386DX notebook with upgradable motherboard and modular M/B design (M/B + Power Board + Video card), w/3.5" desktop type HDD support; upgradeable socket based processor; upgradeable RAM (4 RAM sockets); with no RAM on-board; fan as first forced air cooling system. 1989 EUROCOM 2100: World's first 10-inch 640x480 CCFT Backlit Monochrome LCD; Intel 80C286 12Hz based notebook with mechanical keyboard and external Floppy Drive.